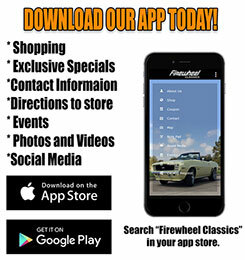 Firewheel Classics is one of the largest first generation Camaro parts suppliers in South Central US. We have been supplying high quality restoration parts since 1997. Firewheel Classics started from our love for Camaros. Camaro restoration was a hobby of ours for many years. Having to deal with many parts suppliers to find the best parts and service available, we decided to start Firewheel Classics to offer only the highest quality parts and unsurpassed service from one supplier. We have expanded our inventory to include Chevelle, Nova, Firebird, Tri-Five, Impala, Truck and Mopar. We are working daily to add all these items to our site. Not only do we offer great products and service, we also offer technical support to help you through your restoration. We feel that any question is a good question, and if we don't have the answer we will find it for you. We promise to provide you with friendly knowledgeable service, the highest quality products at the best possible prices, and we will always appreciate your business. We know that without you, we would not be in business. That is why we make customer service our number one business. All of our products are backed by our 100% guarantee that if you are not completely satisfied with any of our products, you may return them within 30 days from date of purchase for an immediate refund or exchange. See our return policy for details. We carry a large inventory of quality products from the leading manufacturers in the restoration industry. OER, Classic Headquarters, Golden Star Auto Parts, Dynacorn, Goodmark Industries, Auto Custom Carpets, Auto Metal Direct, TMI, PUI, American Autowire, Detroit Speed, Vintage Air, Fesler, Ring Brothers, and many more. Stay up to date on our sales, specials and events.